A Lovely Afternoon With Friends | It's In The Sauce! Summer provides more leisure time for many people, in part due to longer days and a somewhat less hectic schedule. Most children are out of school, and involved in various activities. While many parents are still working, it seems that there is more time available for relaxation. Before the summer passes by, I encourage us to plan how to spend some of the “off-duty” time we have. Perhaps an example of my time spent with friends recently will give some ideas for others. A long time friend of mine (a forty-five year friend, ‘oh where did the years go?!) in another state had knee surgery a few months ago. Since the physical distance between us is eight hours, I was not able to help her recover after she went home, although I had spent a few days with her when she was in the hospital. Other friends took her food, transported her to therapy appointments, and sat with her and kept her company. A few weeks after her surgery, I planned my schedule to be able to spend a few days with her, doing what I could to be of assistance. We had a wonderful few days. One of the afternoons, we visited with a friend of hers who has a lovely antebellum home that is filled with antiques that my friend had told me about and wanted me to see. When my friend Judy called her friend Patty (another Patty!) and asked if it was convenient for us to come by for a brief visit, the answer was, “Of course, and I will have cake and coffee for us.” Telling her to please not go to that trouble fell on deaf ears. Now, I don’t know about you, but if someone called me and asked to come over for a visit, I doubt that I would make a cake! But Patty Hill did, and not just that! 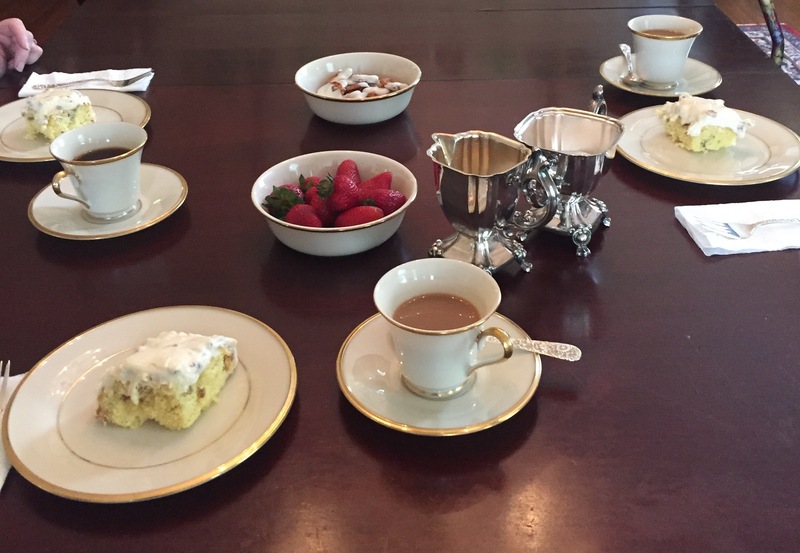 When we arrived, she had coffee in the silver service, delicious home made Italian Cream Cake, fresh strawberries, and chocolate covered pretzels. We sat in the formal dining room and enjoyed an afternoon of good food and wonderful conversation. After that, I had a tour of her lovely home, with stories of the home through the ages that brought it to life. I was so touched by Patty’s hospitality, and the fact that she dropped whatever she had planned to do that afternoon and made us feel so very welcome. This seems to happen more often in the deep South, and this was Alabama. But I wonder if some others of us don’t need to take more time being with others in such a relaxed manner? What would it take for us to do so? We would have to stop spending so much time with “friends” on Facebook and on other social media sites. We would have to do less of some other things, such as watch TV, go out for activities such as tennis, mani/pedis, and lunch dates that have less meaning. We would have to maybe even work less, to schedule some time for a relaxing afternoon with friends. What do you think? Is spending some quality time with true friends not worth more than some of the less important things we do? If we reprioritize our time even occasionally for nurturing times like this, we might find the time to do so more often. I wonder, would our mobile devices even miss us, or we them? This entry was posted in Relationships and tagged friendships, relationships. Bookmark the permalink.